The symbol ΔH is used to represent the change in heat (or enthalpy change) of a reaction. ΔH is measured in kJ/mol (kilojoules per mole). 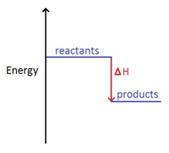 The change in heat (enthalpy change) can be represented on an energy level diagram. ΔH must also labelled. In an exothermic reaction, the reactants have more energy than the products. Energy is given out in the form of heat which warms the surroundings. ΔH is given a negative sign, because the reactants are losing energy as heat, e.g ΔH = -211 kJ/mol. In an endothermic reaction, the reactants have less energy than the products. Energy is taken in which cools the surroundings. ΔH is given a positive sign, because the reactants are gaining energy, e.g ΔH = +211 kJ/mol.